Investigators Thursday began the painstaking work of pinpointing the cause of a wind-fed fire that tore through a Back Bay apartment building, as two Boston firefighters who died trying to subdue the blaze were mourned as heroes. Authorities said it was too early to determine what started the ferocious fire, which trapped Lieutenant Edward J. Walsh Jr., 43, and firefighter Michael R. Kennedy, 33, in the basement and thwarted desperate rescue attempts. But investigators are focusing on the building’s furnace and heating system, according to two officials with knowledge of the inquiry, among other potential causes. “There was some kind of extraordinary event that happened in the basement,’’ Steve MacDonald, spokesman for the Boston Fire Department, said as he stood near the charred remnants of the four-story building at 298 Beacon St., where smoke still hung heavy in the air and ice weighed down trees. More than 15 other first responders were injured in the fire, emergency officials said. Three firefighters remained hospitalized Thursday afternoon, MacDonald said. The mayor’s office announced Thursday the fund would be established at the Boston Firefighter’s Credit Union. MacDonald said he did not believe the eight-unit residence was equipped with sprinklers, and that it was not required to have them. He did not know whether smoke detectors were functioning. While the flames spread quickly from the basement up through the building, firewalls prevented them from reaching adjacent buildings, he said. MacDonald said investigators will have to proceed cautiously given the extent of the damage. “We are still concerned about the integrity of the building,” he said. Boston police, fire department officials, and the Suffolk district attorney’s office are investigating, the standard procedure in a fatal fire. A prosecutor with specific training in fire investigation has been assigned. “At this stage, the investigation is very active, but it’s too early to make any determination as to cause or origin of the fire,” said Jake Wark, a spokesman for Suffolk District Attorney Daniel F. Conley. 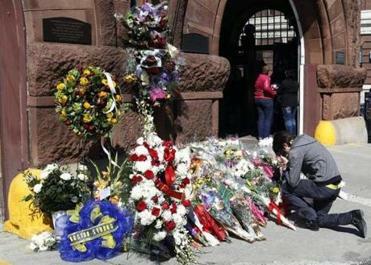 At the Engine 33 firehouse on Boylston Street, where a steady stream of mourners left flowers at a growing memorial for the fallen firefighters, Fire Captain Neal Mullane recalled the frantic efforts to rescue Walsh and Kennedy and the merciless conditions that pushed them back. The force of the blast blew Mullane’s mask off, and burned the right side of his face and head. Several other firefighters were injured by the accelerating flames. Trapped in the basement, Walsh and Kennedy pleaded for more water. But their water line had burned through, the president of the firefighters union said Thursday, leaving them completely defenseless. Thursday at the firehouse, firefighters draped black bunting under an American flag, lowered to half staff. Mourners came to leave messages of condolences and crosses. Some bowed their heads in prayer. Many neighbors say they share a bond with the firefighters, who are often outside the station chatting with people who pass by, and were distraught over the deaths. “This is our station,” said Erin Defuria, who dropped two yellow roses outside the firehouse door. Andrew Mutty, a childhood friend of Kennedy, fought back tears as he stood before the memorial and fondly recalled days they spent riding bikes and skateboards together. In the evening, Cardinal Sean O’Malley paid his respects, and said the firefighters were leaning on one another for comfort. “There's a lot of strength there,” he said. Earlier in the day, Governor Deval Patrick also visited the firehouse. He told reporters that Kennedy had planned to run the Boston Marathon, inspired to run after responding to last year’s bombings. His fellow firefighters still plan to run, Patrick said. “And if it were even possible, that will add another level of solemnity to the occasion,” he added. The Beacon Street building where the fire occurred is owned by the estate of Michael J. Callahan, who lived there until he died in 2002 at age 85, said attorney Frances X. Hogan, who represents Herbert S. Lerman, Callahan’s former lawyer and the executor of his estate. In a statement Thursday, Lerman offered his condolences, thanking first responders, and expressing gratitude that none of the tenants was injured. “We’re tremendously upset about the death of those firefighters,” Hogan said. Hogan said the cause of the fire was a mystery, saying the building was in good repair and that Lerman had hired a property manager to look after it. “Mr. Lerman tried to do everything right,” said Hogan, who works for Lyne Woodworth & Evarts LLP. The property had a troubled recent history as Callahan’s two daughters fought over their father’s personal and financial affairs, resulting in at least four separate lawsuits between them and their father or his estate. The squabbling became so intense that a judge admonished the daughters, Elaine and Patricia Callahan. Michael Callahan’s will, which still faces legal challenges, called for the daughters to get no proceeds from his estate. Prior to the fire, Lerman had been planning to sell the property and donate the money to charity, according to Hogan. On Beacon Street Thursday, people gathered to watch investigators survey the damage from afar. Helicopters whirred overhead, and police officers directed traffic away from the closed stretch of road. People spoke softly, and some stared at the grit-covered scene. When a ladder truck rolled quietly down Beacon Street toward the ravaged building, drivers saw it coming, and moved to the side to clear the way. At the firehouse, Richard Paris, head of the firefighters’ union, shook with emotion as he recalled informing Walsh’s wife and Kennedy’s mother that their loved ones had died. Paris, who said he had slept just 10 minutes in the past 24 hours, approached Kennedy’s mother as she was getting out of her car. She knew something was wrong, he said. “She just kept saying, ‘Where’s my Mike? Where’s my Mike?’ ” Paris said. Breaking the news, he said, was the hardest thing he had ever done. Maria Cramer, Sean P. Murphy, Todd Wallack, Joshua Miller, Meghan E. Irons, Laura Crimaldi, Akilah Johnson, and Kevin Cullen of the Globe staff and Globe correspondent Dan Adams contributed to this report.